I LOVE Cocoa Butter Formula. Their stuff works wonders during the winter for dry skin. 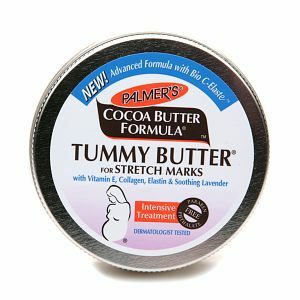 I recently checked out Cocoa Butter Formula’s Tummy Butter for Stretch Marks. This is designed for women during and after pregnancy or weight loss. It’s designed to reduce the appearance of those pesky stretch marks. Cocoa Butter Formula’s Tummy Butter for Stretch Marks is made with Vitamin E, Collagen, Elastin and Soothing Lavender. It’s also made with Bio C-Elaste technology, which is a combination of Collagen, Elastin, Centella Asiatica, Sweet Almond Oil and Argan Oil. All you do is apply in circular motions daily and you should start seeing results. I love how delicious it smells. I usually rub the remnants into my hands because it’s an excellent moisturizer. Cocoa Butter Formula’s Tummy Butter for Stretch Marks is available at your all your favorite drug stores, like Rite Aide, Duane Reade and Walgreens. Click here if you’d like to buy it online. Product was received in a gift bag. You’re right about the smell. I liked the way it worked the best and it made my skin feel very moist. I’d recommend cocoa butter to anyone.